Always a favourite for both visitors and Cairns locals, Fitzroy Island is located just 29km (17 miles) from Cairns and can be accessed in as little as 45 minutes. Fitzroy Island is a continental Island with a total area of 340 hectares (840 acres) with it's highest peak being 269 metres (882 feet). It was separated from the mainland approximately 8000 years ago. While not an actual part of the Great Barrier Reef, Fitzroy Island is located inside the Great Barrier Reef Marine Park and is surrounded by fringing reefs. Home to a resort and campground, Fitzroy Island also offers such pursuits as swimming, snorkelling, seakayaking, fishing, bushwalking or just relaxing on the beach. You can access Fitzroy Island with a basic ferry transfer or choose one of the packages available which will include lunch and activities. All these options are listed below. Day trips to the Great Barrier Reef are also available for people staying at the resort or campground. Half Day Seakayaking at Fitzroy Island. 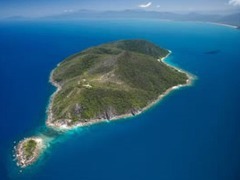 This tour also includes a half day on Fitzroy Island, Lunch and ferry transfers. Suitable for beginners!